We'd almost forgotten how much fun it was to build the suspension on our Locost. Fortunately, replicating the project in half-scale has served as the perfect reminder, and while prior experience has kept us from repeating many of our early mistakes, even the tasks that went well were hard. Tapping the upper control arms for 3/8" Heim joints, for example, an hour each. And cutting and shaping 21 pickup brackets. Just like on the big Locost, making even one of these takes an inordinate amount of time, far more than it's likely worth. We once wondered, back in the early days of our original Locost build, whether or not we'd think about all the time we spent working on suspension brackets or other handmade items once we started driving the car. We now know. We don't. Not ever. We think of the car as mostly a single unit, or maybe a collection of systems, but not individual parts. Certainly some random item welded to some other random item is not going to be within our realm of consciousness, at least while we're driving. Total collapse of the frame, sure, sometimes, but not miscellaneous suspension parts. The junior Locost will probably be no different, except we're unlikely to worry about a total frame collapse, which at 15 mph would be more of an embarrassment than a danger. 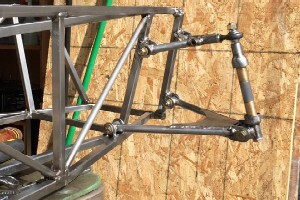 In any case the junior frame seems a lot sturdier than a full-scale frame, although that could just be an illusion based on its excessive weight. Time will tell. 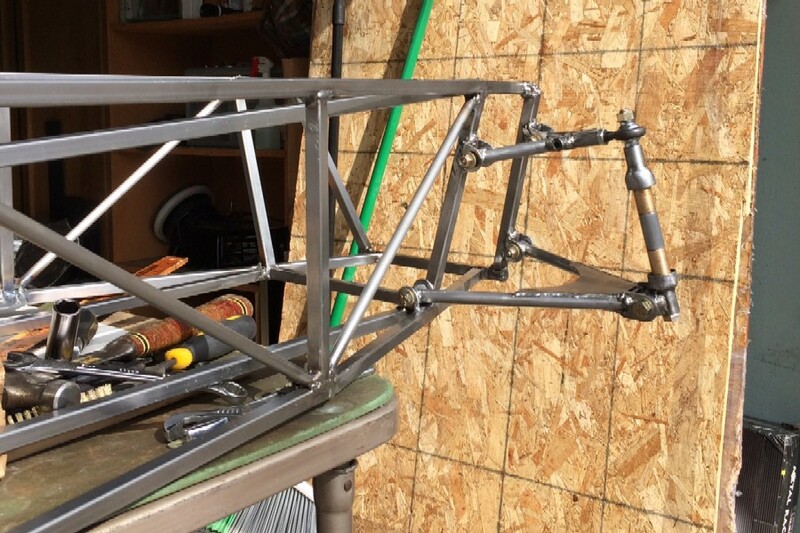 We're hoping that with the small size of the suspension components and other bits, the completed junior Locost will come out lighter than 200 lbs., but even if it doesn't, that's the most we'll ever admit to. 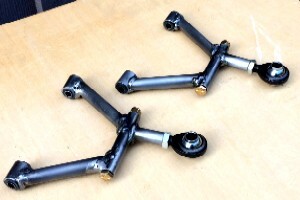 One thing that surprised us during construction of the suspension was the relative simplicity of the upper control arms. With only five short tubes for each, they seemed to go together a lot faster than the control arms on the big Locost. It helped that we only had to build one jig, instead of the three we needed to get the full-scale control arms right, and it also helped that we welded them up ourselves, instead of dragging them off to be TIG welded in a foreign city. We didn't expect to complete the upper control arms anytime soon, or at all, ergo our surprise. The upper control arms are pretty much a match for the upper control arms on the big Locost, except only one tube is needed to attach the outboard end to the spindle, which means the little control arms are not split in two pieces like their big cousins, and therefore don't need to be bolted together. Which of course didn't stop us from bolting them together, or at least simulating bolting them together. The bolts look great, even though they're not actually doing anything, other than adding weight, which as we already noted is not really an issue. Welding the control arms wasn't nearly as difficult as finding half-scale rubber suspension bushings, which was impossible. We soon realized we were going to have to make our own, and after many failed attempts to squeeze various sizes of rubber hoses into our 5/8" bushing tubes, we finally discovered weld-spatter-resistant polyurethane tubing at McMaster-Carr, which was a perfect press fit into the tubes, providing just the right balance between support and compliance, or close enough, and more importantly, the tiny bushings look the part, which is of course their only real job. Once we welded the suspension pickups to the frame and installed all the miscellaneous suspension bits, we were shocked to find the suspension moved easily through its full range of motion. No interference or binding of any kind. Amazing. Even more amazing, wheel camber came out to within a degree of vertical, with a couple of degrees of adjustment available, and track width ended up at 30", exactly what it measured in PowerPoint. The same thing happened with the big Locost, real life measurements matching our plans, but we thought back then it was just a coincidence. This time it's particularly odd in light of the fact that we haven't been nearly as concerned with precision as we were on the big car. We realize in retrospect that much of the preciseness we built into the big Locost turned out to be inconsequential, invisible, or else melted during welding. Not that we wouldn't be just as precise with our next full-scale Locost, or even preciser, but the junior Locost is little more than a display item. If it looks good and manages to achieve the breathtaking speed of 15 mph without disintegrating, it'll be precise enough. 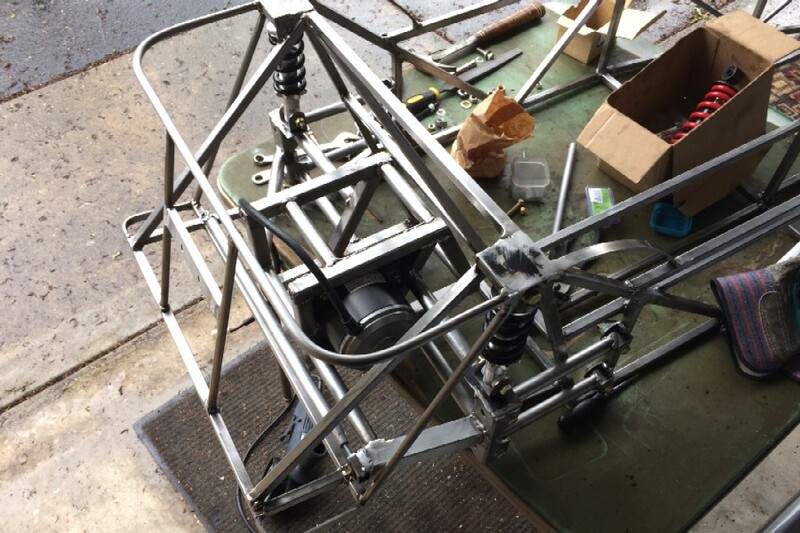 We came up with the final design for the rear axle housing, and did a little work on it, which turned out to be enough to finish it. Not a very complex piece. 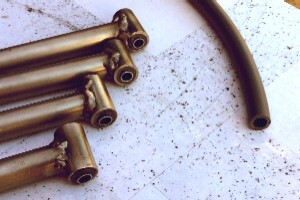 Five square tubes per side and five round connecting tubes, plus a couple of tubes on either side for the trailing link brackets. We also cut and welded a plate of 14-gauge steel for the motor mount, after drilling holes in the plate to mount the motor, slotted so the motor can be moved back and forth to adjust the chain tension. And if you think it's not possible to drill slotted holes, you are technically correct, but we did the best we could with files. The end result is a massively heavy structure that will do the job that a similar design with half the weight would also do. As long as we keep in mind that this is just a prototype, and not a production component, we're okay with it. Our next axle housing will of course be much lighter. We're at least fortunate that the prototype doesn't look overly heavy in photographs, and that it fits in the chassis, barely, and even has a fraction of an inch of travel before it bangs against the frame. Our next axle housing will of course have much more clearance. In better news, we solved our wheel and tire issues with go-kart wheels from Northern Tool. The 6"x4" wheels are wider than we would've liked, but should look okay under fenders that we may get around to making some day. The 14-1/2" tires are only about 4" wide, and look similar to car tires in photographs, so that's good, plus they bolt to the front and rear hubs without hitting anything important, which is excellent. Unfortunately the wheels aren't the preferred silver, but rather a lame industrial white, which could be changed if it weren't for our current ban on painting. So the car is almost a rolling chassis, and once we mount the springs we should be able to push it back and forth in the garage. 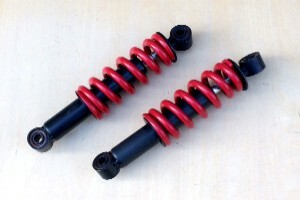 We managed to find tiny coil-over units to fit both the front and rear suspensions, and while the manufacturer of these units euphemistically refers to them as shocks, they in fact have no internal damping, which shouldn't be a problem as the spring rates are so massively high that no actual movement of the suspension is anticipated. Again, we're okay with this, since the junior Locost is unlikely to see any really bad road surfaces. Or any road surfaces. We finally gave in and created a schedule for the junior Locost project. We had resisted this in the past because a) we didn't want any pressure to finish anything, and b) we didn't want to know how long it was taking. 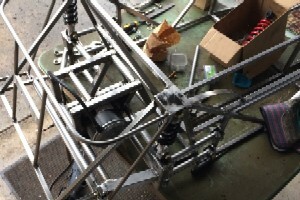 But we do want a rolling chassis at the Maker Faire in May, so we worked out the hours and divided the plan into two parts, this year and next year. As it turns out, we are 78% complete with this year's tasks, leaving us with only about 130 hours of work, or about 12 hours a week between now and May, which is unlikely but you never know.